Feb. 26, 2013, 12:13 p.m.
By Matt Sheehan Feb. 26, 2013, 12:13 p.m.
Editor’s note: Earlier this month, the University of Florida hosted Journalism Interactive 2013, a two-day conference that brought together journalism educators and practitioners. 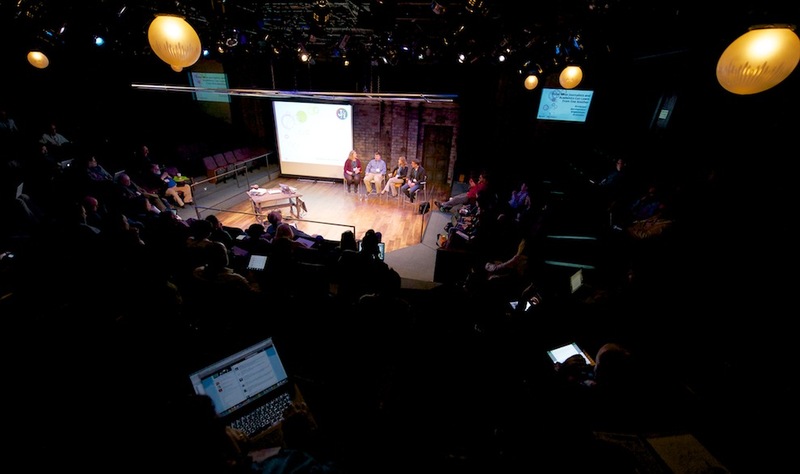 The conference focused on four official themes — data, design, mobile, and participation — and aimed to foster conversation between teachers, researchers, and professionals working in digital media. Matt Sheehan, director of UF’s 21st Century News Lab and of the 2013 conference, shares some of his takeaways from this year’s session. Journalism schools need to rip up the curriculum every year. That was one big point of agreement among the attendees at the Journalism Interactive conference. There are a few very good summaries of the conference online; here are some of the highlights. We must redefine what we consider introductory journalism. Traditionally, we focus on mechanics and AP style as the first steps to a journalism education. Panelists called for more discussion of what journalism can do, rather than only how to do it through traditional story structure. Writing is not going away — if anything, it’s becoming even more important. But we should focus less on the historic frameworks of text (e.g. the inverted pyramid, how to write an obit) and more on news judgment, finding a lede, ethics, tracking information, and analysis — all important skills that journalists can apply across platforms and even to data projects. The time-intensive focus on specific software tools or types of code is not how we should teach journalism; Gilbert equated it to teaching about Watergate through an analysis of how the reporters used AP Style. Unfortunately, our credit-hour structure creates a zero-sum game — the question we constantly hear is “What do we take out to put all this in?” If we focus less on specific tools and more on the higher-level discussions and exploration of possibilities, we will produce students who are able to adapt and meet employers’ expectations. The expectation should be that we produce journalists not who can “do it all,” but who know how to find out how to do what’s needed at the time. Employers aren’t really looking for the candidate who can do it all, either. What they really want — although they may not realize it — is a candidate who is nimble, asks important questions, and can figure out how to tell the story in the best possible way. One of the paradigm shifts (to which many academics and professionals are still adjusting) is fundamental: Everything Is a Remix. With the information and resources available online, there’s no need to recreate the wheel every time. Panelists called for educators to teach students how to browse the resources available — the “giant junkyards of code” like GitHub and other open-source repositories — to find frameworks, inspiration, or snippets for solutions. Remixing is nothing new. It’s an introductory step in art education to take the works of the masters and recreate — enabling the artist to reference that work in the new pieces he or she makes. Journalism should embrace this change. We’re not advocating plagiarism (which the digital age also makes much easier), but we need to teach how to link properly, give credit, curate, and create derivative works. Facebook didn’t create the social network. Apple didn’t create the smartphone. But each — and many other companies — has had great success building on existing work. Journalism — and journalism education — can do the same thing. One of the recurring themes in the discussions onstage and off was the need for colleges to become much more responsive to external forces. We should design our courses to be less rigid, perhaps even subscribing to the Lean Startup model of “build, measure, learn.” Or take a page out of programming project management and the agile development method. Anyone who has ever worked on curriculum in higher education knows the frustrations of the slow pace and red tape. We’ve all read the perspectives from outside academia, and the conversations at this conference centered on individuals serving as change agents — not institutions. Positively, it seems that some of those in the trenches are embracing more of a guerilla style of curriculum change. Academics must embrace a “teach yourself” philosophy when designing courses, and be willing to embrace the fact they may not have all the answers. In the opening session, panelist Lisa Williams said we should stop expecting everyone to know everything and instead know how to find what they need, when they need it. Memorization of every line of code or tool is not required. There are resources available for educators and students, said Cindy Royal of Texas State University. Mentioning Codecademy and Lynda.com, Royal said we must be willing to let go of only teaching what we know and teach students how to teach themselves. Students must become comfortable with professors asking them to discover information themselves; we must avoid oversupplying what UNC’s Laura Ruel jokingly called the “let me Google that for you” service. J/i’s mission is to build the type of common ground and camaraderie among the folks who are in the trenches of change and for those who don’t get to travel to every ONA, AEJMC, SPJ, or other journalism conference each year. (Many of us are on academic budgets, after all.) Admittedly, these types of confabs preach to the choir. We are, however, expanding the flock. To paraphrase UF’s Mindy McAdams, the best part of the conference was bringing together the “folks like me” and meeting the others out there who are facing the same struggles of leading the charge. J/i started in 2011 at the University of Maryland. In the summer of 2012, Maryland and the University of Florida entered an agreement to continue the conference and find a sustainable model for keeping the conversation going. An idea to form an informal consortium of journalism schools was born. Missouri and North Carolina signed on shortly before the 2013 conference opened. We plan to take advantage of the groundswell of support following our successful conference in Gainesville and move toward the planned third installment of Journalism Interactive in October 2014 in College Park. We hope to continue the discussions among leading journalism schools and expand the consortium. We firmly believe j-schools should be on the forefront of the sweeping changes in our industry and information culture. We, and our deans, are firmly committed to seeing that happen. Can we get an amen? POSTED Feb. 26, 2013, 12:13 p.m.
Sheehan, Matt. "Breeding unicorns and building off others: Lessons from a meeting of j-schools and the field." Nieman Journalism Lab. Nieman Foundation for Journalism at Harvard, 26 Feb. 2013. Web. 24 Apr. 2019. Sheehan, Matt. "Breeding unicorns and building off others: Lessons from a meeting of j-schools and the field." Nieman Journalism Lab. Last modified February 26, 2013. Accessed April 24, 2019. https://www.niemanlab.org/2013/02/breeding-unicorns-and-building-off-others-lessons-from-a-meeting-of-j-schools-and-the-field/.